When Emma accidentally breaks her mother's old perfume bottle she also unlocks a family secret exposing herself and her cousins Gretchen and Penelope to a world full of magic and witches that had previously been kept hidden from them. Now the girls must get to grips with their new abilities before they risk exposure to the Order of the Iron Nail. As if that wasn't bad enough Emma also managed to open the gates to the Underworld, releasing the Greymalkin sisters who are now on a murderous spree attacking innocent young witches. Since Emma keeps being the first person to find the bodies she is under suspicion from the Keepers and at risk of having her magic taken away if they find her guilty. Can the cousins gain control of their power and figure out who is helping the Greymalkin before one of they become victims themselves? 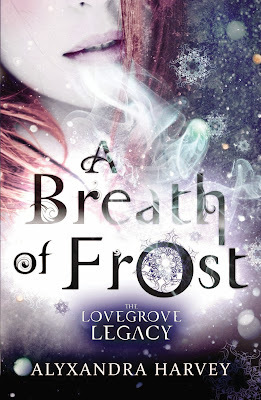 As a huge fan of Alyxandra Harvey's Drake Chronicles series I couldn't wait to read A Breath of Frost, the first book in her new Lovegrove Legacy trilogy. This series starts out a lot darker than the Drake Chronicles and has a fabulous Regency London setting. I love reading books about witches and was hooked on this one from the prologue when you read about a young girl with a cat familiar breaking into a old witch's house to steal from a dead body! Alyxandra Harvey throws you straight into the action and then lets you gradually learn the rules of magic alongside the three cousins. Things unfold slowly and at times I was left feeling uncertain but that just helped me connect to the characters even more and my questions were all answered as the story progressed. One thing this story definitely has is great characters. Emma, Gretchen and Penelope all have very distinctive and different personalities but I liked all three of them immensely. Emma is the calm and practical one, she is quiet and tries to avoid confrontation but she is very protective of the people she cares about. Gretchen is the most outspoken of the trio, she is quite a tom boy and hates the way women aren't allowed to do everything men can do, she doesn't like to follow the rules and is happy to jump into any possibility of adventure. Penelope is the sweetest of the three, she is kind and loving, very gentle and softly spoken but she has a core of steel so don't let her sweet nature fool you. I loved the way all three girls were so close to each other, they could easily have been sisters and they would all do anything to protect the others. The girls are intelligent and inquisitive so although they've been thrown in at the deep end when it comes to learning about magic they work as a team and have each other's backs no matter what. I have to mention Emma's love interest Cormac too. It took me a while to figure him out and I wasn't sure if I liked him or hated him to begin with because the way he ran hot and cold with Emma made me incredibly irritated with him at times. Thankfully we get to see part of the story from his point of view so we understand exactly why he behaves the way he does and that makes it easier to forgive his actions. I grew to really love him as we learnt more about his background and I really hope that we'll see a lot more of both him and his sisters as the series continues. Cormac and Emma make a great team and although their romance wasn't at the forefront of the story I did enjoy the obvious attraction between them. A Breath of Frost combines magical mayhem, a murder mystery and the high society of Regency London full of balls, afternoon tea and finishing schools with a difference. I loved the mystery surrounding the girl's powers and why Emma's mother had tried so hard to lock them away and I enjoyed getting to know the different characters and the rules they have to live by. I can't wait to continue reading this series and I think Alyxandra Harvey has another hit on her hands! 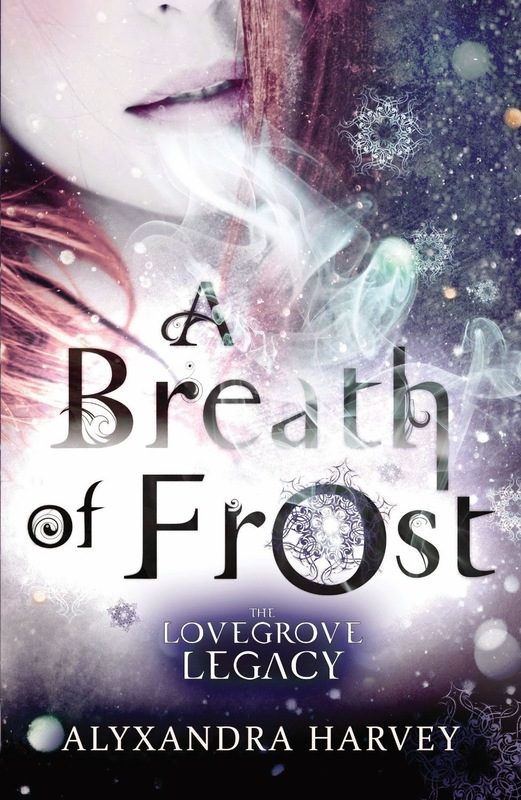 Magical, thrilling, romantic, and full of surprises, A Breath of Frost was a brilliant YA read. I absolutely loved this book! Everything about it was amazing. I've read books by this author before and absolutely loved them. This book definitely doesn't disappoint.